Birmingham Half Marathon and the London Marathon are races which Atlas Sports Injury Clinic prepare runners for. Regular sports massage and injury treatments from running distances can mean the difference between making it to the starting line or being a spectator. 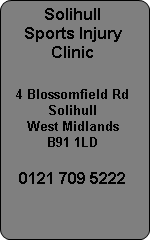 Solihull Sports Injury Clinic has a running injury clinic dedicated to treating runners and running injuries. Injury diagnosis and treatment is available from our Solihull Sports Therapists and Solihull Physiotherapists at the clinic. Meghan Beesley is an elite UKA 400 metre hurdles athlete who has used our clinic for years.